☀ Health Functions: blood pressure monitoring, real-time heart rate monitor and remind, Sleep Monitor and Alarm,automatically track your sleep quality, and alarm silent vibration will wake you up. ☀ Remote control phone camera:Use this function for selfie or group photos with a better pose or photo sight. Open the camera function in the app, you can use this smart wristband to easily control your phone camera. ☀ Multi-functional Fitness Tracker: accurately track your steps, distance, calories burnt, sleep quality and heart rate all day. 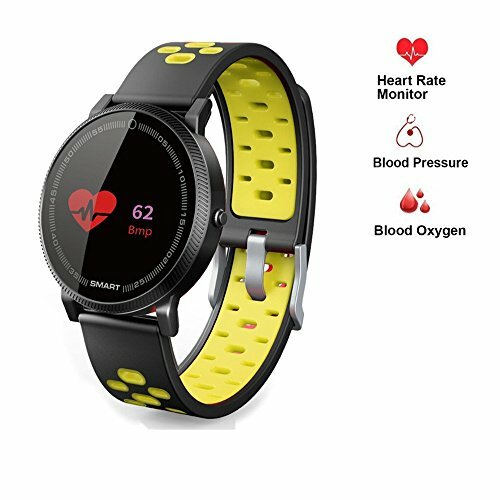 √ Health functions: blood pressure monitoring, real-time heart rate monitor and remind, Sleep Monitor and Alarm,automatically track your sleep quality, and alarm silent vibration will wake you up. √ Multi-functional Fitness Tracker: accurately track your steps, distance, calories burnt, sleep quality and heart rate all day.